Humans do most of their growing in childhood and through puberty with only minimal gains in height after that. Most children will need the help of their parents in order to reach their maximum height. To grow tall, children should avoid drugs and any unnatural pieces of equipment, despite any marketing claims that they help kids grow taller. Give your child nutritious food to eat. This includes proteins, fruits, vegetables, calcium and fats. The best proteins are white-meat chicken, fish and soy. Red meat contains a lot of protein but is loaded with saturated fats that can cause health problems. Your child should have at least two portions of fresh vegetables and one portion of fresh fruit every day. Calcium is essential for growing--milk, cheese and yogurt will satisfy these needs. Fats are essential for growth, but not fats from animal products. Unsaturated fats like those found in avocados help provide the dense nutrients that will help an individual gain size and strength. Children should drink about six bottles of water every day. Write down your child's bedtime on the calendar and make sure he adheres to it. This is a vital step in reaching his peak height. The body needs significant rest during childhood and the early teenage years and sleeping on a comfortable bed is vital. A minimum of 8 hours per night is needed before puberty and your child should come close to that total (6 hours minimum) during the teenage years to reach maximum height. Teach your child stretching exercises to reach maximum height. Exercises like the lumbar bridge, the cat stretch, the super cobra and the single-leg stretch can help stretch out muscles and stretch the spine. 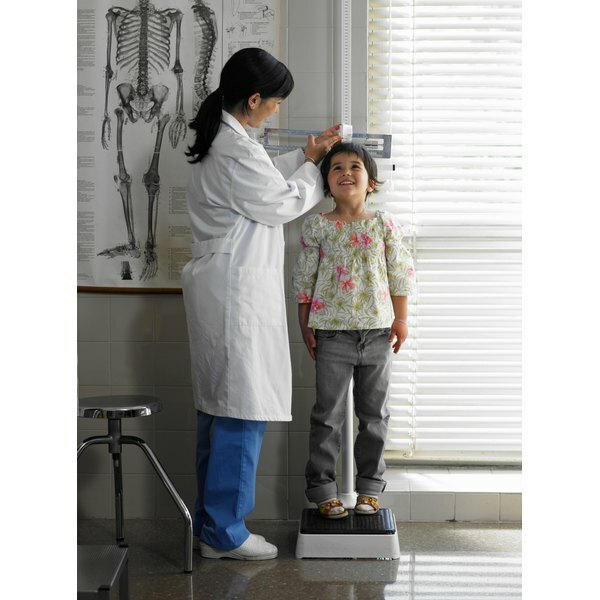 This will help your child stand at her height without hunching over. Hanging from a pull-up bar and doing pull-ups will also help your child's posture. Guide your child in breathing exercises to reach maximum height. Have your child breathe in slowly through the nose as he does this. Have him hold his breath for another 3 seconds and then exhale slowly through the nose. Breathing like this for about 2 to 3 minutes out of every hour will help circulation and help your child reach maximum height. Stay away from artificial growth hormone injections.